If you know Rain, BoA (shown left), and Sistar, then you already know K-Pop, Korea’s contemporary pop music and its artists. K-Pop music is one of the fastest growing music genres in the world, and along with Korea’s popular TV drama serials, films and comic books are a growing source of export revenue for Korea. On December 31, 2011 Korea's Culture, Sports and Tourism Minister Choe Kwang-shik announced a 2012 policy to expand support of Hallyu, to help keep the wave of Korean pop culture surging across its borders. The Korean government also hopes to attract more Hallyu fans into the areas of food, tourism, fashion and other cultural and entertainment offerings. Leaders from Hollywood and S. Korea’s entertainment industry and academia convened in November for a summit at the University of Southern California in Los Angeles to explore the impact and future of Korea’s pop culture and entertainment, encompassing its music, films, television drama serials, and comic books. PBS program Lidia Celebrates America: Holiday Tables and Traditions - a Chinese New Year is dedicated to chef, author, and founder of Wok Wiz tours Shirley Fong-Torres who passed away of leukemia after a brief illness in June, 2011. 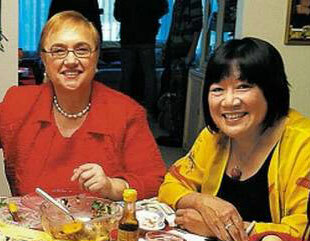 The program filmed the host, TV chef, author and restauranteur Lidia Bastianich with Shirley Fong-Torres walking through San Francisco's Chinatown and celebrating the Chinese New Year with a dinner at Shirley's home in the San Francisco Bay Area. It was one of Shirley's last television appearances. Shirley's brother, author and broadaster Ben Fong-Torres also makes an appearance in the program. Lidia Celebrates America: Holiday Tables and Traditions - a Chinese New Year is the first in a series of specials coming to PBS. The PBS special featuring Shirley Fong-Torres aired on December 20, 2011 nationally and continues to be broadcast on future television schedules. Check your local PBS listings for new airing dates of this special. The series explores the American immigrant experience through the revelry of the holidays. In future specials scheduled for broadcast in 2012, Lidia will feature a variety of tasty ethnic celebrations, including weddings, rites of passage, and celebrations of independence. Today, January 1, 2012 marks the day that a major hotel chain, The Hong Kong and Shanghai Hotels, Limited (HSH), owner of the Peninsula Hotels finally made it official - no more shark fins will be served. We hope many more hotels, restaurants, and fishermen will also stop killing the millions of sharks for their fins for soup. Let's make 2012 a year that you also take measures in your own hands to help our world become a better place. This is one of the most important stories of our lives, our Earth. Not only is banning shark fins from menus one tiny step forward (and not ordering shark fins if it is still on other menus), eating fish, particularly the larger fish is not necessarily healthy. Dr. Sylvia Earle, 75, scientist and National Geographic Explorer-in-Residence has been studying our oceans for more than 50 years. Dr. Earle urges everyone, "We have the power to make a difference and its time that we use that power positively not just for the dolphins, not just for the whales and the fish. It all comes back to us. We all share space on this little Blue Planet." Earle told AsianConnections' Steven Joe at a Greenbuild Conference for GreenPlanet.TV "What we are doing to the oceans, we are doing to ourselves." She told Steven Joe in a video interview that it is a myth that eating all fish is healthy. She warns that eating larger fish-eating fish is not healthy at all. She says the larger fish such as swordfish, tuna, and marlin have the highest concentrations in their bodies of heavy metals and toxins including mercury, fire retardants, pesticides and other poisonous substances that are dumped into the oceans and fall from the sky from coal and other industrial processes. Shirley Fong-Torres 1946 - 2011, noted cooking personality, author, and SF Chinatown culinary school and tour operator of "Wok Wiz"
Friends and family honored Shirley Fong-Torres' life at memorial services in San Francisco on July 24. Her life and vivacious personality touched people worldwide with her books, television appearances, and her Wok Wiz company's daily guided walking and culinary tours of San Francisco's Chinatown and North Beach. Shirley was born November 16, 1946 in Oakland, daughter of Connie and the late Ricardo Fong-Torres, and was a graduate of U.C. Berkeley. She was a teacher in Texas and California, a chef, and after working in marketing for Levi Strauss, she created Wok Wiz in 1985, offering tours, as well as cooking lessons. Her business drew rave reviews and quickly grew, and she built a staff of tour guides to meet demand. She wrote such books as San Francisco Chinatown: A Walking Tour, The Chinese Kitchen, Wok Wiz Chinese Cookbook, and The Woman Who Ate Chinatown. Shirley wrote articles for many food and travel publications and frequently appeared on radio and television including The Food Channel, History and Discovery Channels, and inflight for Hawaiian Airlines, Qantas Airlines and JetBlue. She was active in many community groups and often served on the board of the San Francisco Convention and Visitors Bureau. She had homes in San Francisco and Pacifica. She and her former husband, Richard Dong, were the parents of Tina Dong Pavao, and she was a vivacious, fun-loving grandmother to Tina’s two daughters with Matt Pavao, Maggie and Stella. Shirley is also survived by sister Sarah Watkins, brothers Ben and Burton Fong-Torres, and Sarah’s children, Lea and Jason Watkins. A wonderful brother, Barry, preceded Shirley in death in 1972. In lieu of flowers, the family suggests donations to any of several organizations, including the Chinese Historical Society of America, the Community Youth Center, and the Leukemia & Lymphoma Society. The inaugural 2010 Festival was 100% sold-out; this year’s festival expands to one week from May 2-8, 2011 at various locations throughout New York City. Participants of the LUCKYRICE Festival include members of the LUCKYRICE Culinary Council – Daniel Boulud, Susur Lee, Anito Lo, Masaharu Morimoto, amongst others, to include some of the world’s top restaurants, chefs, and mixologists. Tickets can be purchased at www.luckyrice.com. Proceeds from the festival will again benefit City Harvest. LUCKYRICE is an integrated experiential marketing and media company that was launched in the spring of 2010. LUCKYRICE has quickly become the definitive guide to the Asian culinary world, which represents sixty percent of the world’s population. LUCKYRICE understands these cultures and creates a common denominator through the lens of food. Annisa | 7:00 – 10:00 p.m.
One of the city’s most beloved chefs kicks off the LUCKYRICE week of festivities with an intimate dinner full of surprise guests and tantalizing things to eat.